For a lot of us, March is that lost month. We’re enjoying the best skiing of the season while looking forward to Spring Break on the beach or warm days at the lake or on the trail. 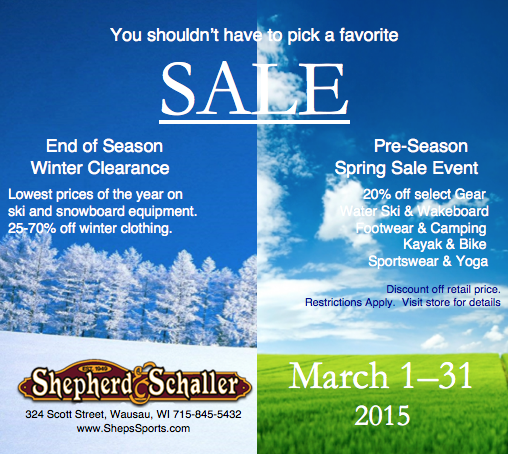 At Shepherd & Schaller you don’t have to choose which season to celebrate and plan for. All March long you’ll get end-of-the-season clearance prices on our remaining ski and snowboard equipment and 25-70% off winter outerwear and sportswear. At the same time, enjoy 20% off retail price on select water ski, wakeboard, bike, tennis, camping and paddling gear and new summer fashions, yoga, swim and footwear. You decide. Is it our best post-season sale or pre-season sale of the year? We’re here to help you make the most of your time in store and out. I’m looking to sell/trade and upgrade some of my kids ski equipment. Do you hold a yearly exchange sale? Thank you. Previous Previous post: Sneak Peak: 2016 Ski and Snowboard Staff Picks!